Painting to me is like dancing with color on canvas. I find it a form of meditation, where time disappears. My teacher Rassouli has a technique, what he calls “Leila” (creating and destroying) which frees the little girl in me to have fun and play with creation. The joy is I never know what is going to show up on the canvas.” Fusionart, this style of painting, allows me to quiet my inner critic, tap into and express the joy, energy and sense of spirit that has always been the core of my being. My paintings come from my soul, are inspired by nature, and they are pure joy and pure love. Diane was born in Los Angeles, California and has lived in the area all her life. However, this does not mean that she is geographically confined to L. A. On the contrary, she is universal. She has traveled widely throughout Europe, Israel, Central and North America and South Africa, where she has bonded with nature. In the forests of Costa Rica, the Whitewater Rivers of Idaho and the Kalahari Desert in Africa, she has found her love for adventure. She loves life and it shows in her art. She comes from a family of artists, her father did woodwork, her sister is a sculptor, and her older daughter is a multidimensional artist. She is very close to her family of three children and six grandchildren. As a child and young adult Diane did not show much interest in painting, although she displayed her creative nature by knitting, crocheting, needlepoint and flower arranging. 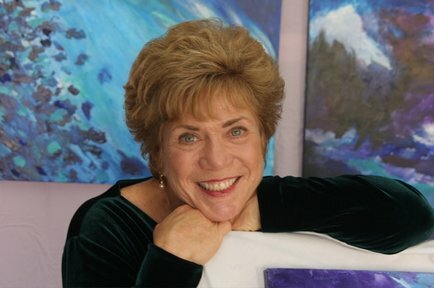 She did not think of herself as an artist until the year 2004, when she joined Rassouli’s “Painting with Spirit” class at Agape International Center. Rassouli’s class revealed to her the artist that she is and she has been painting ever since.. To the casual observer, her art may seem abstract, but nothing is further from the truth. Her art is a faithful representation of her soul, full of love for nature, love for the human race and love for life, which shows in the fluidity of her work. Her extensive travel as well as her love and nature and adventure influences much of her work. This is evident in her bold colors and explosive energy that shows up in her paintings. She is very active and gets much pleasure from biking, hiking and dancing.